Taryn and I headed down to Knoxville on Friday for our first half of the season. I hadn’t done this race before but heard great things about it from Alyssa and others and was super excited for the race. Taryn and I stayed at the Four Points Sheraton directly across the street from the race expo, which was an awesome choice. I would definitely recommend staying at the Sheraton if you decide to do this race (and you should!). Most of Friday was taken up with the drive, so we didn’t pick up packets until Saturday. After we got those, we hit the practice swim, which is always really critical for me, with swimming being my weakest of the three disciplines. Luckily, the practice swim went great. Everyone was super friendly, the swim was very low key, the water temp (68 point something) was perfect – I couldn’t have asked for a better start to race weekend. We also did a short ride and run, checked our bikes in at transition, attended the athlete briefing, and then went to bed early. The day before a race always goes by faster than I want it to! With everything going so smoothly on Saturday, I woke up feeling positive and excited on race morning. I got up at 4:00 and we left the hotel around 5:15, which is when transition opened. No race number tattoo or directional snafus this time. We were able to walk to transition and get there by 5:30, which was great, and we had until 6:30 to get set up. We thought an hour in transition would give us more than enough time to get ready, even if something went wrong. Sure enough, I had to visit the mechanics, as I couldn’t get a reading on the pressure in my rear tire (this is a recurring problem, as I need a valve extender on my rear tube and it’s constantly causing me problems). In any case, they were super friendly and helped me out quickly and efficiently. Huge thanks to those gentlemen for helping me out! I also spoke to the race officials in transition (I had a random question about where I could put my bag because it was too large to fit neatly by my bike) and they were super friendly. The head official was from Atlanta and we chatted a bit. I loved the low-key, friendly atmosphere at this race from start-to-finish. It really makes such a difference in terms of keeping the athletes calm. The Race Director told us in the athlete briefing on Saturday that our racing experience was their top priority and it really showed throughout the weekend. As I was finishing getting set up in transition, I happened to look down at my ankle. No chip. I stayed calm, and walked over to Taryn to tell her what was happening. She immediately stopped what she was doing and went to talk to a volunteer about getting me a new chip, as I retraced my steps trying to figure out where mine could have gone. Ultimately, I found it (it had slipped off when I took my pants off), but it was definitely a scare. We finished getting organized in transition and started the walk toward the race start right around 6:30, with our wave scheduled to start at 7:00 a.m. It’s about a half mile walk from transition to the swim start, but it wasn’t bad at all. And, as a bonus, we were treated with a gorgeous sunrise. Soon enough the race was starting and the two waves in front of us had gone off. It was our turn and we walked down to the dock. It’s an in water start, and they give you about five minutes to warm-up in the water before the start. We jumped into the water and I felt good warming up. I was ready to go! Oh, the swim. My day did not get off to the start I had hoped for. In terms of the race itself (as opposed to my personal performance) I actually really liked this swim. Our wave was quite tiny and we were able to spread out a lot at the start. It was a simple out and back course (with the back section slightly longer than out, since the swim start and finish were at two different points along the river) and the water temperature of 67 degrees was really perfect for a long-sleeved wetsuit. The sun made sighting for the first half quite difficult, but, generally, I liked this swim more than most. It should have been a great swim day for me. The problem came when my cap started creeping upward around the turnaround. If you know me at all, you know I am a rule follower. Always have been, always will be. The minute my cap started to slip, I was panicked about getting a penalty. At the athlete briefing the day before the race, they had emphasized littering as something they would be looking for during the race. Surely coming out of the water sans cap would be a penalty, right? I wasn’t sure. But I thought it was a possibility. I knew I couldn’t swim holding my cap in my hand. Especially since I wasn’t even half way through the swim. I had to figure something out and I had to do it fast. I tried stopping several times to pull it down. This wasn’t working because my head was wet and the cap would just slide right back up. The only result was that I was messing up my goggles. It was one of those situations where time (and quite literally other racers) seem to be passing you by at warp speed, but you can only seem to work in slow motion. After several attempts, I knew this approach wasn’t going to work. I finally swam over to a kayak and asked the kayaker if I could hold on and try to fix my cap. I took my goggles off completely, took the cap off completely, and started from scratch. I finally got my cap back on my head, got my goggles back on, and started swimming again, but it felt like an eternity had passed while all of this was going on. I did finally finish and get out of the water (volunteers pull you up on to the dock and then there is a bit of a run to get back into transition), but I was definitely shaken up. Looking at photos afterward, it was very obvious my cap wasn’t on properly before the race even started. Photo from the Rev3 Facebook page. Lesson learned to make sure I really pull my cap down completely before future races. I’ve done a lot of riding this month, including the Tour de Skyline, which entailed riding over 200 miles in 2 days with a ton of climbing. I thought I was set up for a super strong bike. However, with the less than ideal swim behind me, I spent the entire start of the bike just trying to calm down and stop being mad at myself about my damn cap! The course starts in the city and then heads out to the country. In the more rural sections, there were some spectacular views. It actually reminded me quite a bit of riding in Loudoun County. Hilly, but very scenic and green. I would classify the bike course at Knoxville as a challenging course. Before the race, I had read in a race report that this is “not a PR course” and I think that’s definitely true. There is a lot of climbing and for some reason, I felt like I couldn’t really take advantage of the downhills as much as I normally would, which usually helps make up for the climbing on a hilly course. There was a course marking snafu (not Rev3’s fault), but that didn’t impact my race. I thought the course was very well-marked with color-coded arrows and signs throughout. There were also a few special “caution” signs along the course and those were helpful. I really only found one turn to be especially tricky. There were two turnarounds on the bike course and I was able to see Taryn twice along the course, which was nice. My overall bike speed was slow – in the low 17s – which is slower than where I wanted to be. Even though I stayed on top of my nutrition throughout the ride, I definitely felt like I wasn’t able to go as fast as I had expected. I finally got back to transition at 3:15, which was honestly pretty disappointing. I dismounted, ran back in to transition, and got ready for the run as quickly as I could. So, my PR for a 70.3 run is a 2:02, which I ran at Challenge Atlantic City last year. After my solid run at Monticelloman (a 54:14 on a challenging run course) earlier this month, I thought I would be in the same 2:00 ballpark here, but obviously, I thought wrong. I didn’t start out strong and die in the heat or get injured or anything like that. I was just running slow from the get-go. I tried taking in extra calories along the run course, thinking that may give me a boost, but instead, all it gave me was GI distress. At each of the aid stations (spaced about one mile apart along the run course), I took a gel or Coke or Gatorade. I tried ice in my bra. I tried ice in my hat. I really wanted to “fix” whatever my problem was, but nothing was working. I’m honestly not sure what I could have done differently to remedy the situation. I was just slow. The only thing that really hurt on the run was my feet. I am using a different brand of elastic laces this season and they are not as adjustable as the ones I used last year. My feet must have been swollen because my shoes were painfully tight (I wore the same shoes in Monticelloman without any issue). Although this wasn’t ideal, I don’t really think it impacted my race. It was an annoyance, but, again, I don’t think there was any clear cause to my bad run – it was just one of those off days. Toward the very end of the run, two of the Rev 3 Team athletes ran up from behind me and were trying to encourage me along (thanks, guys! ), but I really didn’t have anything extra to give. They ran past me and I just kept trying to put one foot in front of the other until I crossed the finish. This ended up being my slowest 70.3 run EVER (yes, even slower than Syracuse, which is a much tougher run course) at 2:18:19. It was definitely NOT the run I had expected to have at this race. My final finish time was 6:25:52 (it hurts just to type that), which landed me in 8th place in my age group (18 out of 47 women). In happier news, Taryn was waiting at the finish for me. She had a fantastic race and WON her age group! This was her second podium this month! We ended the day on our balcony, over-looking the expo, sipping sparkling wine to celebrate Taryn’s awesome day. It was the perfect way to end the day. 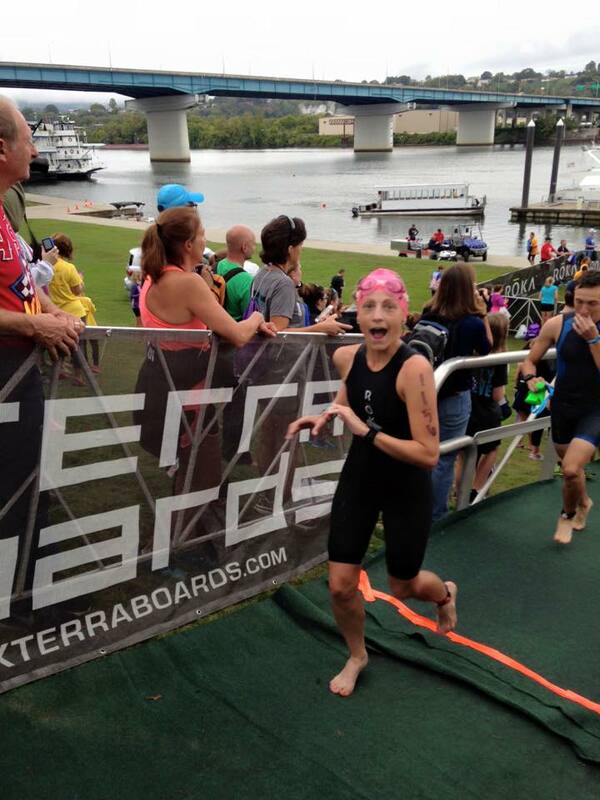 Despite my performance, Rev3 Knoxville was a great race. The volunteers, Rev3 staff, and Rev3 Team athletes were all fabulous. I loved the course. Rev3 puts on a fantastic, well-organized race. I loved this race and definitely plan to go back someday. While my race was disappointing, I am trying to convince myself that I will come back stronger and smarter from this experience. Everyone has bad races – even the pros – and the only thing I can do about it now is to have a positive attitude and move forward. As always, I want to thank my awesome husband for his support; Alyssa, who even called me after the race from somewhere on her journey home from Lanzarote to give me a post-race pep talk; Bobo’s Oat Bars; and all of Ignite’s fabulous sponsors. Next up for me is the Tupper Lake Tinman half on June 25. If you’ve visited any triathlon or running websites lately, you’ve probably read at least a few (dozen) articles about the “off-season” being a great time to focus on projects or goals you’re too busy or exhausted to tackle during the season. Last winter, I made a concerted effort to improve my nutrition and strength and, while I certainly have plenty of room for improvement in both areas, I was successful in making noticeable gains on both fronts. This winter, one of my focuses is to improve my attitude toward swimming. First, a little background. As a kid, I loved playing in my grandma’s pool. Mostly doing handstands, or playing Marco Polo (great Netflix series, btw), or picking up objects from the deep end, or jumping off the diving board. I was very comfortable “playing” in the water, but I wasn’t lap swimming. Fast forward to November of 2010, when, after completing my second marathon, I decided I wanted to try a triathlon and signed up for an adult beginner swim class at the local rec center. I loved the teacher and class, but it was a rude awakening. I was exhausted after just trying to swim 25 yards, even though I was in marathon shape. I also realized I had no clue how to do a proper stroke. I didn’t know my arm wasn’t supposed to go straight out in a giant circle like a windmill. I had a lot of work to do. Of course, I did learn to swim well-enough to get through that portion of a sprint, Olympic, 70.3, and finally an IM distance race, but it’s always something I dread. As my husband says, I only swim so that I can bike and run. 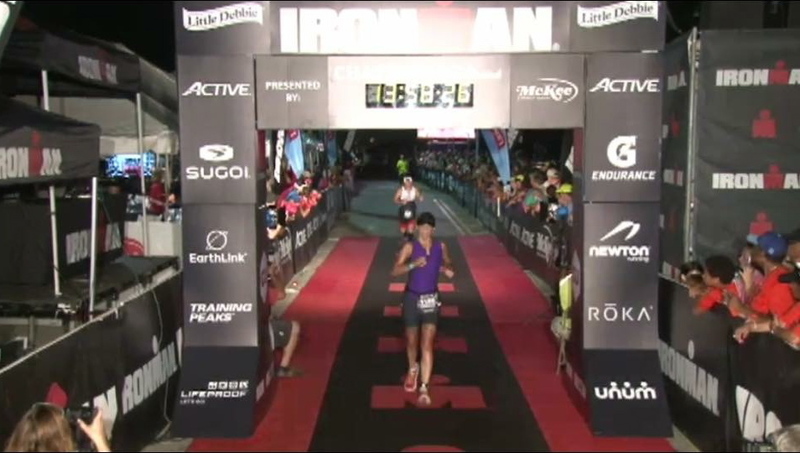 Leading into Ironman Chattanooga, I thought I was going to be a “one and done” for IMs. 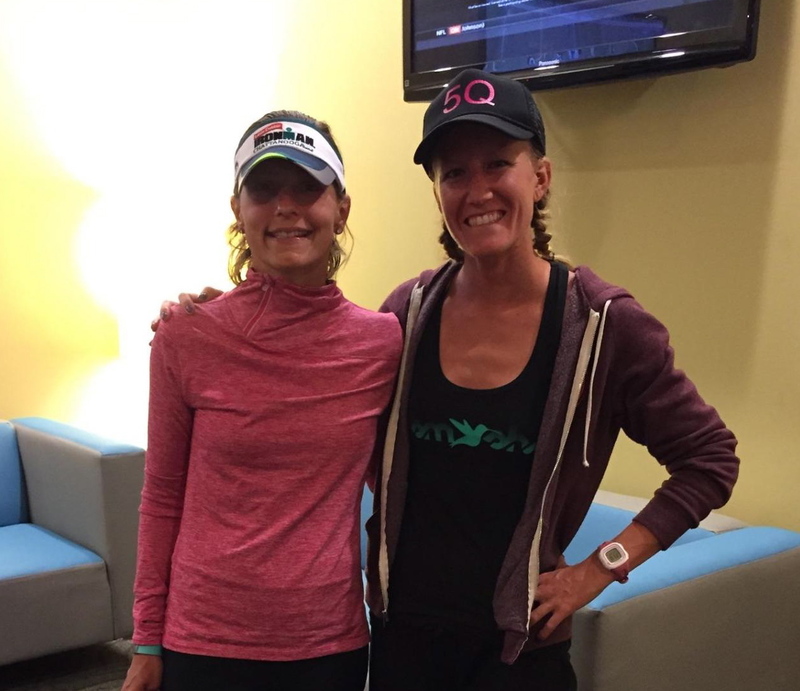 There were a few reasons for this – the cost of triathlon, the amount of time it takes, etc. – but one of the biggest considerations was the fact that I couldn’t imagine making myself swim for another year! Of course, after Chattanooga (a dream come true day for me, despite some mechanical difficulties on the bike), I immediately signed up for Ironman Mont Tremblant. I knew this meant another winter of forcing myself to get to the pool. The word “forcing” tells you everything you need to know about my relationship with swimming. I decided that I needed to change my mindset toward swimming and I asked Alyssa to help me brainstorm on this. We decided to try adding masters back into my training schedule. I’ve tried two other masters programs before and I didn’t find it super helpful for where I was in my training at that time. I was nervous about starting again because I remember the humiliation that comes from not being able to keep up with the rest of your lane and – worse yet – getting lapped. UGH! 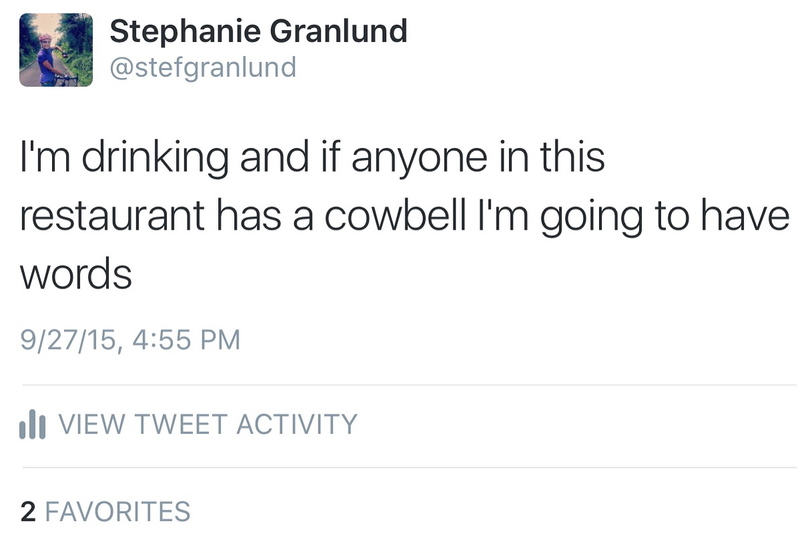 ALYSSA! Totally a guilt trip she knew would work on me. So, up I got at 4:00 a.m. and stumbled out the door to the pool, probably looking like I had been roughed up by a mugger in the parking lot. Much to my surprise, it actually went well! So well, in fact, that I even asked Alyssa if I could add masters to my schedule on Thanksgiving morning. I’ve now gone five times and I’m really enjoying it. The hardest part – BY FAR – is the 4:00 a.m. alarm and I am still adjusting to that. One of the things that has helped in that regard is having coffee made and ready to go when I get up and having a Bobo’s Oat Bar waiting for me as a quick and delicious pre-workout snack. The coffee and food definitely help to wake me up. I’ve also totally lucked out that my masters coach and my lane mates have been AWESOME and so understanding when I have had questions. I think this is really key to the experience being enjoyable for me. I also love having one of the day’s workouts out of the way by 6:30 a.m.! Coach always knows best and I’m glad she sent me that text to give me the push I needed to give masters a try. I’m so happy to be enjoying myself in the pool again and I can’t wait to see how this will translate to improved swimming during my races in 2016! 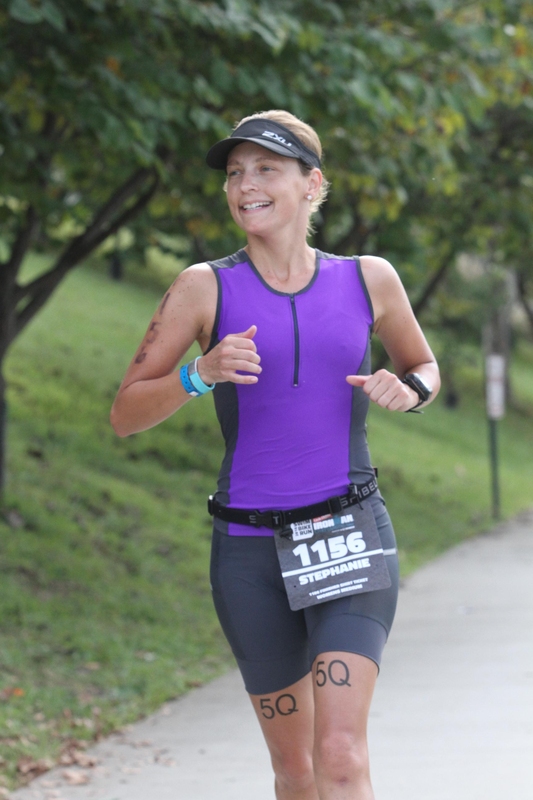 One year ago, I volunteered at an aid station on the Ironman Chattanooga run course. The following day, I registered for the 2015 edition of the race. 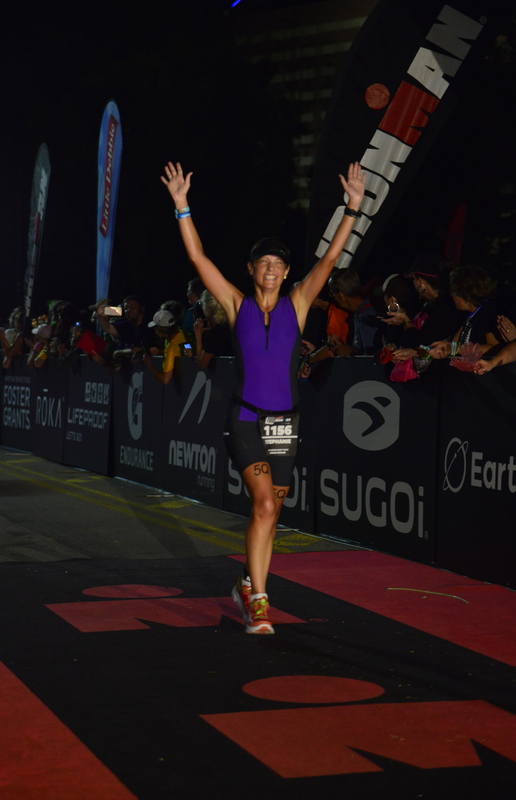 Every day since, I’ve worked toward one goal: becoming an Ironman. On Sunday, my dream came true. Thanks for the screenshot of my finish, Leslie! We left for Chattanooga on Wednesday, the 23rd. With this being my first IM, I wanted to get into town early to make sure I had plenty of time to get settled and not feel rushed. The drive took about eight and a half hours, which wasn’t awful. When we arrived, I went for a short run to scope out the area. Our hotel location was great! If you are thinking about doing this race, I would definitely recommend staying at the Doubletree. We were just a couple of blocks away from transition and numerous restaurants in every direction (there is also a Whole Foods about a five minute drive away). Our room, although on the smaller side, had a mini fridge and microwave, which always makes race morning breakfast easier. 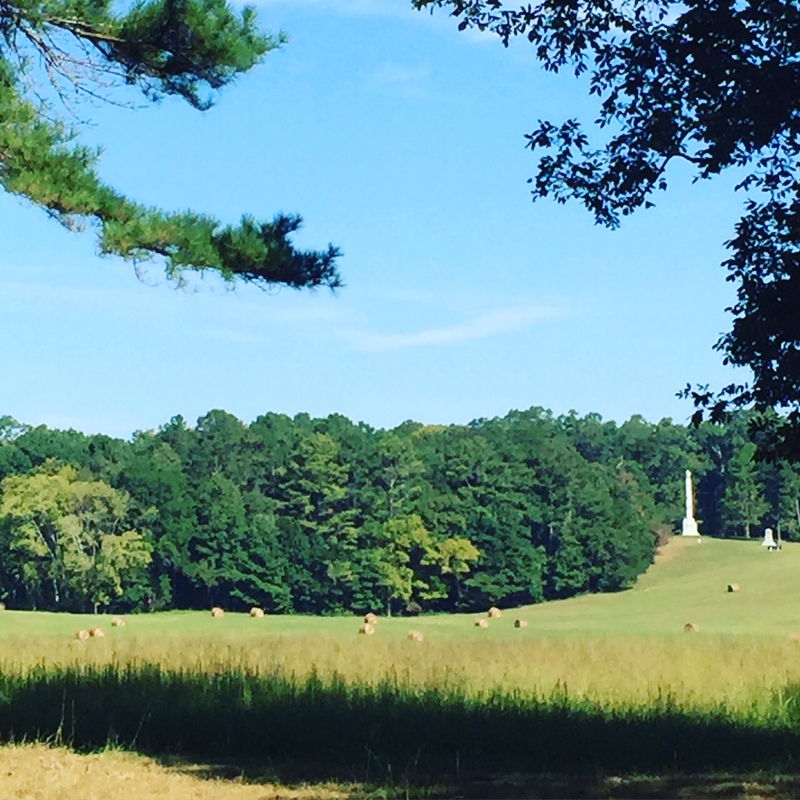 On Thursday morning, I did a short ride around the Chickamauga Civil War battlefield in Georgia. 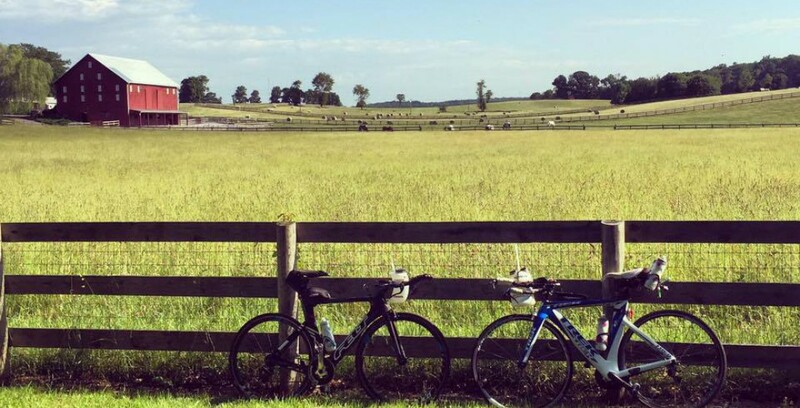 I had posted in the Ironman Chattanooga Facebook Group (definitely join this group if you plan on doing the race) asking for recommendations for rides without a lot of traffic and several people suggested I drive to the Battlefield and ride there. After riding there myself, I understand why this is a popular place for cyclists. I definitely recommend it as a safe and scenic place to ride for anyone doing the race next year. It wasn’t very far away (about a 20 minute drive from transition) and there was ample parking at the Visitor’s Center. There isn’t a lot of traffic and the cars I did encounter gave me plenty of room. It was also gorgeous and I lucked out with a perfect weather day, too. I felt great and loved the scenery – I really could have kept riding all day! I just had to stop and take a picture of this scene. Two monuments in a field of hay bales. 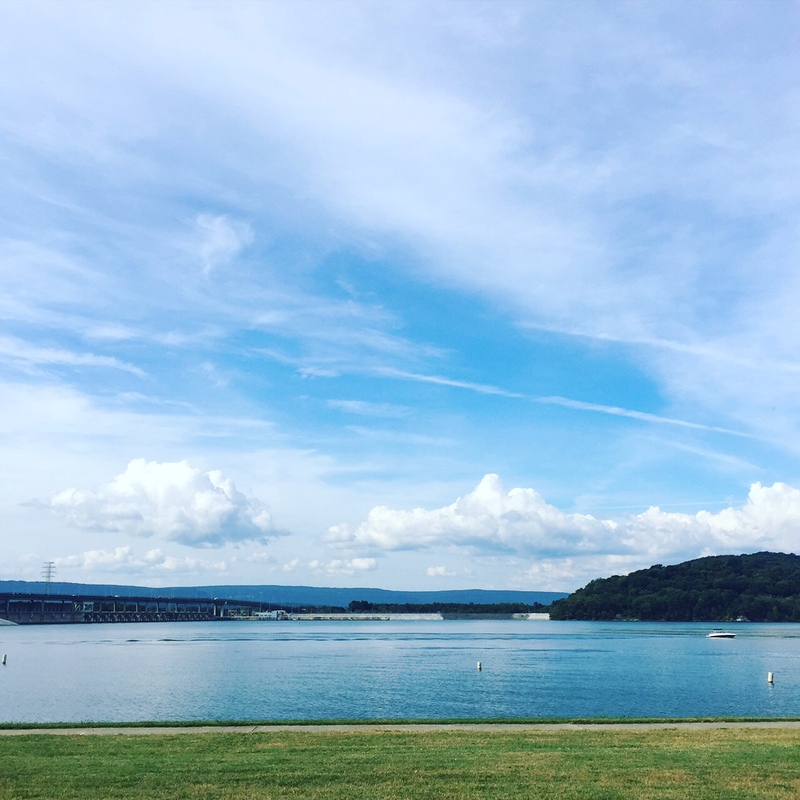 Later in the day, I went for a short swim at the Chickamauga Marina. This is another place to check out if you’re doing the race next year and want a good practice swim spot (the lawyer in me feels the need to say that you swim at your own risk at the Marina, as there are no lifeguards on duty). The water was super shallow in spots, but it was still good to get in the open water and it felt much safer than jumping in the Tennessee River by myself! I also went to the Athlete Village to check-in, pick up my bib and chip, and shop on Thursday. There is an option to do athlete check-in on Friday, but I wanted to get this taken care of on Thursday to give myself plenty of time to figure out the gear bags! My last “to do” for Thursday was attending the athlete briefing. On Friday, I got my bags together, drove the bike course, and attended the Team HPB team dinner. Alyssa and three of her athletes (including myself) were racing and it was nice for everyone to get together for some social time before the race. Whiting was in town from Boulder to do the race and Leah from Salt Lake City. We had a great time chatting and getting to know each other. I checked, double checked, and triple checked my lists for my gear and special needs bags. On Saturday, Whiting and I met in the morning to join about 30 other racers for an informal practice swim in the River. We also ran into Leah and her family there. Last year, there was a formal practice swim put on by the race organizers, but they did not include one on the schedule for this year. So, a group of athletes organized a practice swim via the Facebook Group. It was really nice to have Whiting as a buddy in the water. We swam together (she is a much faster swimmer than me, but we kept an eye out for each other as we went), which made it feel a lot less scary. The water temperature was perfect. After our swim, Whiting and I went for a short ride together and then we turned in our gear bags and checked our bikes. I must say, it felt sort of weird to give away all of my stuff. 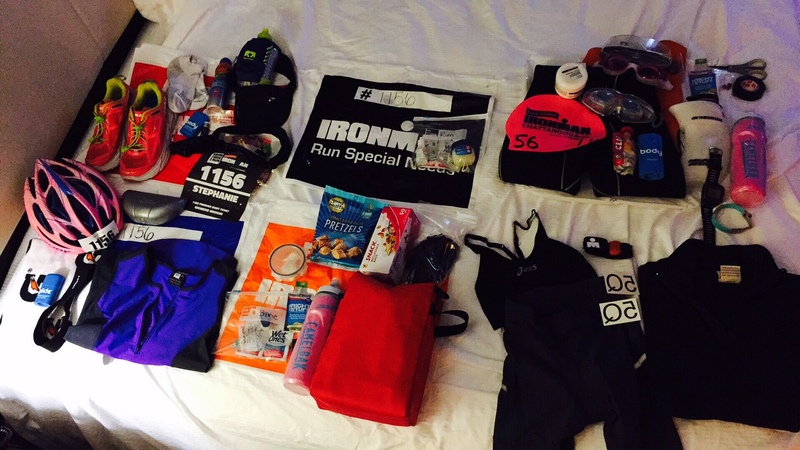 It’s hard to hand over control of these important pieces of gear pre-race. I did a short run back to my hotel and then we met up with Jon’s parents, who had just gotten into town for the race. We went for an early dinner together and then I went back to the hotel to rest my legs. Whiting and I had planned to meet outside of hotel at 5:15 to walk to transition. I was following her lead since this was my first IM and her fourth. We dropped off our special needs bags and then went to set up our bikes. I will talk more about that later. After we finished up with our bikes, we got on shuttle buses to ride to the swim start. When I woke up on race morning, they had already posted on the official Facebook Page that the race would be wetsuit optional. Alyssa and I had discussed in advance that if that was the case, I would wear my ROKA swimskin. Even though I am not a strong swimmer, I am much more comfortable in my swimskin than my wetsuit, so I was actually pretty happy about this news. More people than I expected decided to wear wetsuits anyway. They started after the rest of the racers and weren’t eligible for awards. In any case, after we got off the shuttle bus, we walked quite a distance to get to the end of the line for the swim start. This race has a first come, first served-style rolling start. I was so lucky to have Whiting to wait with in the morning before the swim. We took turns holding our spot in line and using the porta potties and stayed together right up until we made it to the dock and it was time to jump in the water. If you do this race in the future (which I do recommend you do!) know that the swim start line moves quickly once it gets started. Be ready to hustle! It’s kind of a frantic start, but maybe that’s better for someone like me who will freak out if I stop and think about what I am about to do. I had a great swim. I didn’t panic and kept moving. I even tried to get on some feet to draft, although I need to work on picking the right feet (I was either behind someone too slow or too fast every time I tried this!). I am so very glad I did the Jim McDonnell Lake Swim earlier this year. I think that really helped my swimming confidence, since I knew I could swim two miles continuously (even though that was a wetsuit swim for me and this was not). I kept what felt like a steady pace throughout. My swim time ended up being 1:12:52, which was quite good for me, especially without the wetsuit (it would have been a good time for me even considering the current, which people are saying saved around 11-12 minutes). When I got out of the water I was pleasantly surprised that I was able to spot Jon! I gave him a shout and a wave. Then, as I was running toward transition, I saw my friend Mindy! I was so excited to see her! So, back to the morning in transition before the race began. When I got to my bike in the morning, there was a tube draped across my seat. I thought that was odd, but, at least initially, didn’t think into it any further than that. I put my bottles on my bike and then proceeded to try to inflate my tires. The front tire was fine, but I was unable to put any air in my rear tire. Something wasn’t right with my valve extender, even though it had been fine on Thursday for my ride around the Battlefield. Then I realized my bike was in a different gear than I had left it the day before. Whiting speculated that one of the bike support folks noticed I had a flat and changed the tube out for me. This definitely gave me some pause at the time. After some hemming and hawing, though, I decided that I would just leave the rear wheel alone since surely they had pumped up the tires when they changed out the tube that morning (or, at most, the day before). And, hey, that meant all of my bad flat tire luck was clearly out of the way, since the chances of me getting a second flat in one day would be slim to none, right? I thought I should just be thankful that a “flat tire fairy” saved my day and not stress about it. In hindsight, I probably should have trusted my instincts that something was wrong and taken the time to get it checked out by one of the on-site mechanics. Fast forward to the race. To make the very long and upsetting story short, within two miles into the bike course I got another flat and from then until I finally got mechanical support at the first penalty tent (maybe around mile 25? ), I just could not keep air in my rear tire. It was just one flat after the next. Yes, I did check the tire, but I couldn’t find anything wrong with it. I did try to have a volunteer radio for bike support, but they indicated they were busy helping other people and couldn’t get to me. I felt completely helpless. All I kept thinking about was this Norman Stadler clip. As I stopped, I had to beg other racers for tubes/cartridges as they were riding by because I ran out (in the athlete meeting they indicated this was permitted under the rules). People were awesome and I am so thankful for their generosity. I kept thinking that I would fix it (I know that sounds crazy, but I really kept thinking that). Finally, after several unsuccessful stops attempting to fix the issue myself, I decided I just had to get myself to an aid station and wait for mechanical support, no matter how long it would take, because clearly I wasn’t able to deal with this on my own. At one point, I had asked a volunteer about walking to the next aid station, but he said it was too far. I ended up riding on a flat tire (yes, I know this is bad) to the next aid station where finally they were able to radio to get me help. Spectators kept yelling at me that I had a flat tire as I rode by. When the bike tech arrived, he inspected the tire and agreed that wasn’t the problem. He took everything apart and found that my rim tape had gotten bunched up (I’m sure there is a more technical way to describe this) and that was causing the flats (in my race wheels, I need the rim tape to protect the tube from the spoke holes in the wheel). I hadn’t even thought about checking that. The bike tech recognized my bike and said he was the one who had fixed my first flat in transition on race morning. Since I had ridden without incident at the Battlefield on Thursday, something obviously happened either during my short ride on Saturday, in transition over night, or during the first couple of miles of the race that led to the tape slipping. I’ll probably never know for sure what that was, but obviously the timing was unfortunate. After he finally got everything back together and ready to go, a total of almost an hour of non-moving time had passed. I was worried I wouldn’t make the bike cut off after so many stops and so much wasted time. I wasn’t even sure what the bike cut off was, but I knew there was one and that I was way behind. The mechanic and another athlete who was stopped at the aid station told me I could still finish before the cut off, so after I gave them hugs, off I went. Once I finally got going, I was really trying to balance the urge to make up time and the knowledge that going too hard too early (I wasn’t even a quarter of the way into the bike leg at this point) would only make my day worse. I tried to work, but not go crazy. I ended up riding at a little over 17 miles an hour average pace, which felt hard, but definitely wasn’t killing me. My Garmin had autopaused during all of the stops and recorded me finishing the 116 mile bike course in 6:35:35, which would have exceeded my expectations going into the race by almost a half hour (I was thinking I would be right around 7:00). Of course, I understand that 6:35 wasn’t actually my time, but I really want to try to focus on the good parts of the day and not let the unfortunate bike issues overshadow what was otherwise a magical experience. While all of this was happening, Jon had taken over my Facebook and Twitter accounts to keep my friends and family updated on my progress throughout the day (although, some of his funniest posts were updates on his activities). He had done this during my first 70.3 as well. One of Jon’s tweets from the race. For obvious reasons, I was ELATED to get off of my bike and start running. 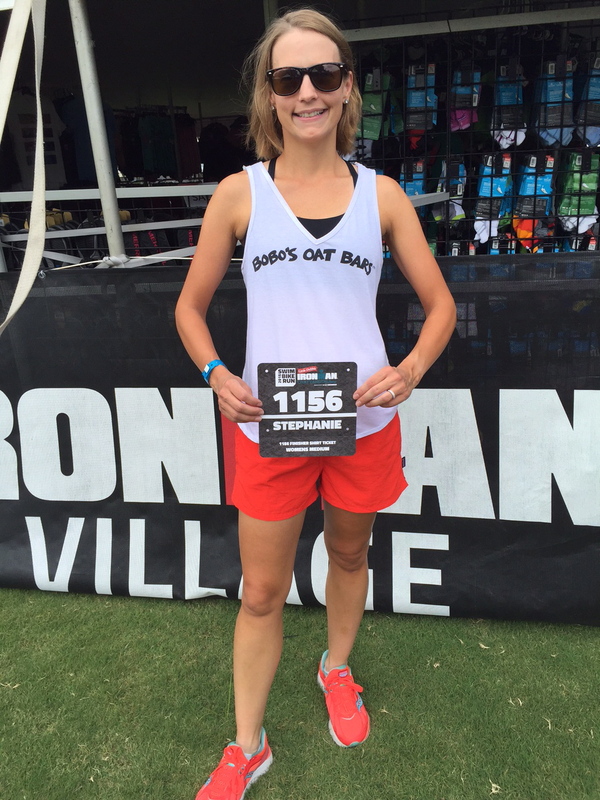 With this being my first Ironman, I had no idea what to expect from my body on the run. I knew I needed to just take it slow and steady, one step at a time. I had a blast on the run. I really wanted to run the entire way because Leslie convinced me that even a slow run is better than walking. I kept thinking of her and my friend Emily, who I did most of my longer runs with this summer. Emily and I would never stress over pace on our long runs. We would just run and talk and it never felt like a chore and we always got in the miles (or time). I told myself to run relaxed, but steady, just like I was running long with Emily. I must say that the miles actually ticked by very quickly. I wasn’t super focused on my pace, but knew I was staying in the right ballpark, even with the significant hills on the run course. I was sick of gels, but knew I needed to eat, so I ate things I normally wouldn’t – bananas, pretzels, grapes. When my stomach would start to go, I would switch to pretzels one at a time and Coke. I think everyone’s stomach feels awful at this point in the race and it’s really just about managing that discomfort as best you can. I kept passing mile markers and once I hit halfway, I KNEW I was going to finish before midnight. It’s funny because another lady I was running with said the same exact thing. We both knew at that point that even walking we would make it. I finished the run in 4:45:37. That’s actually my third fastest marathon time ever. Alyssa had told me she thought I could run that fast and I thought she was insane. One of the (many) traits that makes her an awesome coach is that she really believes in us, even when we don’t believe in ourselves. Overall my run splits were pretty even (fastest was 10:05, slowest 11:52 on a hilly section). One of the highlights of my day was text messaging Leslie after the race to tell her that I didn’t walk! When I approached the finish chute, I was so immensely happy. I saw Alyssa and she said something like “you did it!” I was so glad to see her. I was definitely crying tears of joy. The volunteer who “caught me” asked me if something was wrong – presumably because of the tears. I said I was fine and that I was just really happy. The funny part here is that after I finished I was reading through all of my messages and my teammate Bri had read my lips and knew that’s what I said to the volunteer. I love my team! After the race, Alyssa met up with us at the hotel. I was so glad that she had a great race, too! I can’t say enough how much I loved this city, the spectators, and volunteers. But for the bike issues, I could not have asked for a better race experience. I would definitely do this race again! I want to say thank you again to Jon, Alyssa, MooMotion, Bobo’s Oat Bars, and all of my friends and family for their support. I got so many amazing emails, text messages, voicemails, Facebook posts, etc. from my friends before, during, and after the race. I am truly so lucky to be able to do this thing I love and to have such an awesome group of people supporting me. Thank you all!